HAYS, Kansas (January 5, 2018)— Five registered nurses at HaysMed were honored recently at a recognition ceremony and luncheon. They completed the yearlong RN Residency Program offered at HaysMed, part of The University of Kansas Health System. The program began a year ago in February 2017 and the nurses spent the first 3 weeks in a classroom setting. The remainder of training focuses on clinical experience, one on one mentorship with their preceptor, high-fidelity simulations and on the job training. Additionally, nurses receive training from professionals in several departments, such as radiology, pharmacy, cardiac care, periop and others. 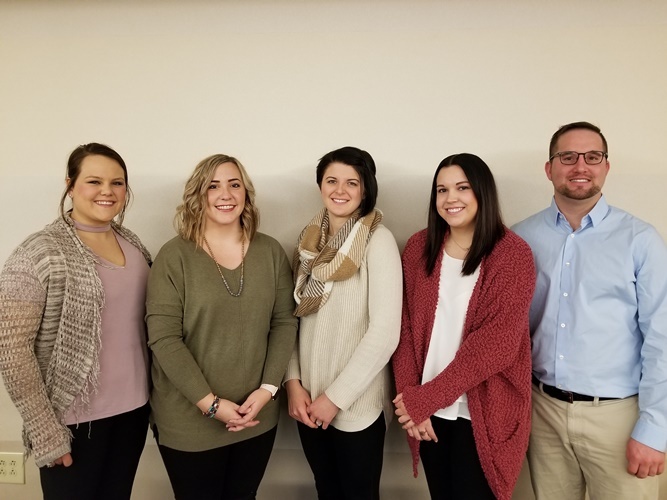 The RN Residency class included Benjamin Clinkscales, RN, Makenzie Henman, RN, Shaley Knickerbocker, RN, Kourtney Lovelady, RN and Carlie Morris, RN. Currently there are 3 nurses scheduled in the next program which begins in February. There is also one nurse from Pawnee Valley Community Hospital in the Rural Residency program. The program is open to newly graduated RNs.